The ancient Temple of Apollo monument on Naxos is barely visible as winds carry sea spray up and over the Palatia peninsula. This amazing shot was one of three photos shared on Facebook by Manolis Lykouropoulos. Wild winter: While it was the ongoing economic turbulence and political bluster in Greece that made headlines around the world this week, surprisingly severe winter weather conditions in many parts of the country were just as wild, crazy and unpredictable. 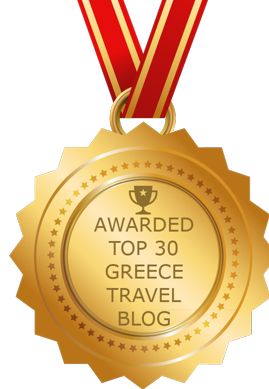 For several days, and especially on February 10 and 11, Mother Nature thrashed many of the Aegean islands and parts of mainland Greece with an unusually vicious torrent of wind, waves, rain, sleet, snow and cold temperatures. The latest barrage of bad weather came slightly more than a month after a similarly brutal storm system brought icy temperatures, freezing rain and heavy snowfalls to many of the Greek Islands in early January (see my posts Wild winter weather wallops Greece and Snow scenes from the Cyclades to view photos and videos that were shared on social media during and after that storm). 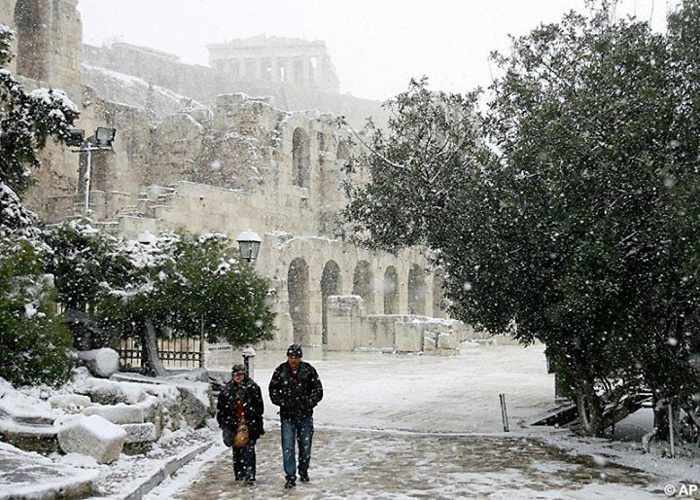 Snow falls on the Parthenon (top) while two pedestrians walk past the Odeon of Herodes Atticus next to the Acropolis in Athens. Flowmagazine posted this photo on its Facebook page February 11. This week’s weather disturbances dusted Athens and surrounding areas with light snow, while various islands including Skiathos, Samos, Karpathos, Crete, Naxos and Tinos experienced either light flurries or significant snowfalls in some regions, particularly in mountainous areas. Freezing rain accompanied chilly temperatures in many places. But it was relentless gale-strength winds that wreaked the most havoc, flooding popular waterfront tourist areas on Crete, Samos, Mykonos and Naxos. 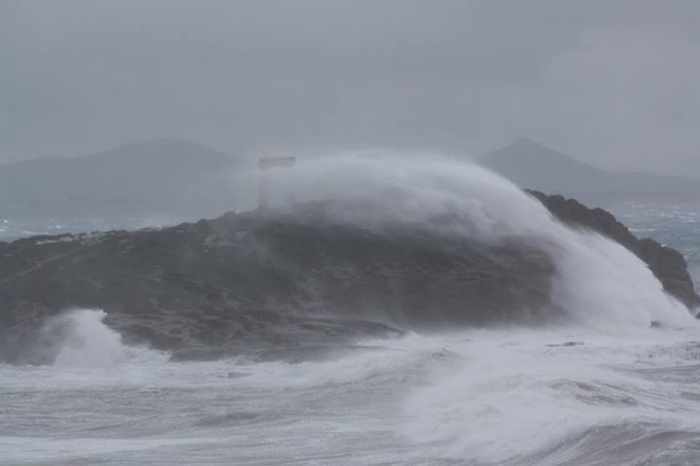 Gusts registering force 10 and higher on the Beaufort wind scale raged across the Aegean, pushing powerful waves against coastlines, ports and harbours. 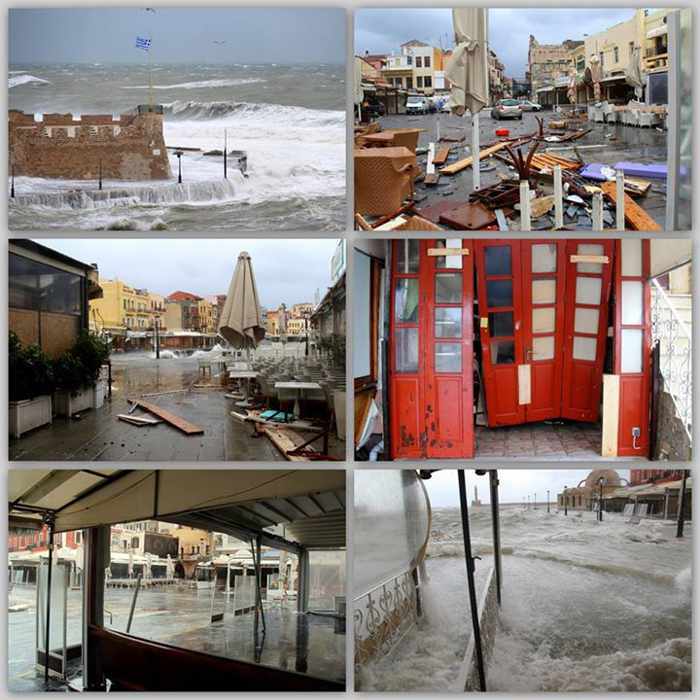 Particularly hard-hit were the Chania harbourfront on Crete, the Little Venice seafront of Mykonos Town, the Naxos village of Apollonas, and the Long Beach area of Kokkari village on Samos, where seawater surged ashore, flooding streets, shops and restaurants and leaving muddy debris — and even the bodies of drowned animals — in its wake. The winds and water also caused extensive damage to the port of Evdilos on Ikaria. Please click on the link below to continue reading page 2 of this post, which includes more news, photos and videos of storm activity and damage on several islands.